Set Sail Learn is back in swing at Treasure Island Sailing Center (TISC) this week with its fall program which runs through October 23. The program, which launched in 2013 thanks to a significant grant from the St. Francis Sailing Foundation, is now in its 5th year and in the past year alone provided a whopping 1300 4th graders from the San Francisco Unified School district with the opportunity to go sailing and learn about all things related to our oceans. The Foundation continues to support the program and is proud of that which it has accomplished in a short time. 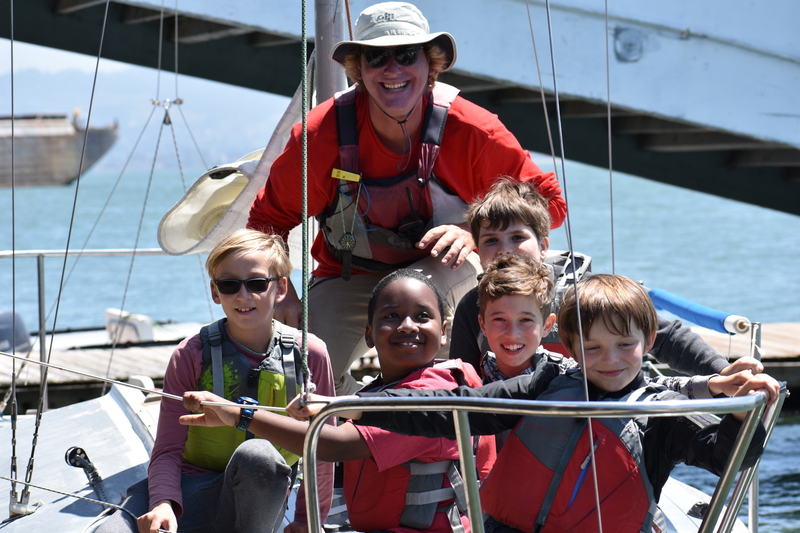 Set Sail Learn provides a fun and educational classroom experience while introducing students to sailing and the Bay. 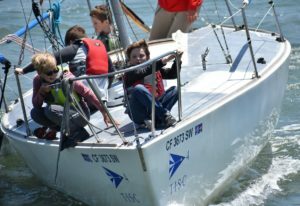 For most kids participating, it is a first-sail experience for them, and often their first introduction to the Bay waters. It teaches them not only how to enjoy the Bay but also how and why we need to protect it. “SSL provides a meaningful STEM based curriculum which supplements and reinforces next generation science standards (NGSS) being taught in school but does so in an engaging way which cannot be replicated in any classroom,” said Travis Lund, TISC Executive Director. Set Sail Learn takes place Monday through Thursday, with one group of up to 30 4th-graders from one school participating per day. On the water, the kids sail in RS Ventures unless the predicted wind is above 15 knots, then they’re in J/24’s. In the classroom, the program offers a lot of science curriculum which teachers can work with prior to the kids coming to the program, and then it offers curriculum for a week or two after they leave so the experience does take longer than just the one period. The kids are also sent home with information about Opening Day, summer camps, etc., fall and spring classes with the hope that they’ll return. An instructor of Industrial Design at Cal Berkeley, Harris-Adamson loves all things science and sailing so it’s special to her to be able to share that with some many young kids. 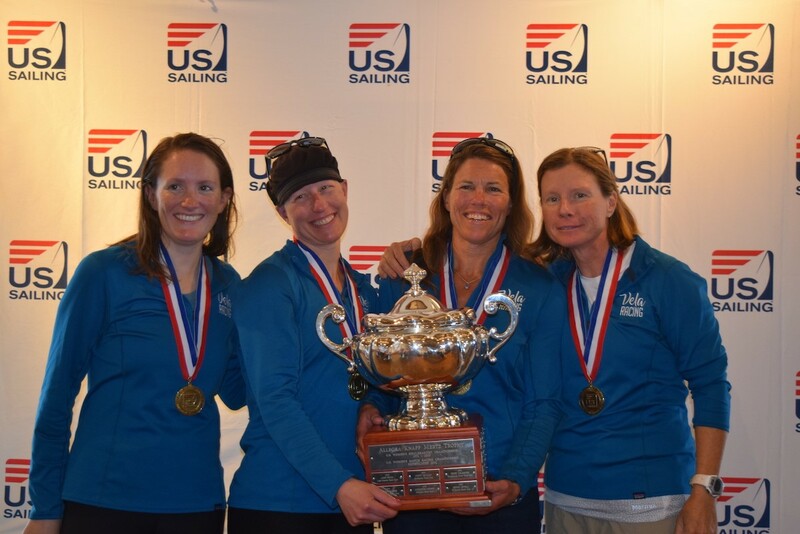 Without a single loss, Nicole Breault and her St. Francis Yacht Club (StFYC) crew of Molly Carapiet (San Francisco, Calif.), Hannah Burroughs (San Francisco, Calif.) and Karen Loutzenheiser (Santa Cruz, Calif.) successfully defended their 2016 title at the 2018 U.S. Women’s Match Racing Championship, hosted by St. Francis Yacht Club, August 24-26. Allie Blecher (Long Beach, Calif.), sailing with Ali Blumenthal (Bethport, N.Y.), Beka Schiff (San Diego, Calif.) and Molly Noble (Hood River, Ore.) for Cal Sailing Club, fought hard for second in a tiebreaker semi-final against Janel Zarkowsky (Annapolis, Md.). 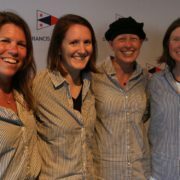 The St Francis Sailing Foundation caught up with Breault, a Foundation grantee, to chat about she and her crew’s success on the Women’s Match Racing circuit. StFSF: How did you manage not a single loss? What was working for you? NB: The team benefited greatly from our experience sailing together in match racing on the city front over the past few years. We also put together great training sessions in the weeks leading up to the event, sparring with Stephanie Wondolleck’s SFYC team once and another time with an ace team organized by Russ Silvestri. The four of us felt physically strong and fit – that plus our familiarity with boat handling J/22s in our home waters (with wind, ebb chop and significant current) gave us real confidence dueling against our competitors. I knew I could put the boat anywhere I wanted with control. While we had plenty of intense exchanges, the adrenaline rush always felt good and never shook us from making good tactical decisions. StFSF: Tell us about your crew for this regatta? Have you raced as a team before? What are each other’s strengths? NB: Molly Carapiet, Karen Loutzenheiser, and Hannah Burroughs are core members of the Vela Racing team. We have gone to battle together many times. 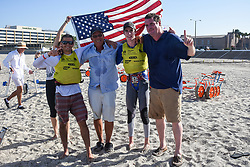 They were my crew in the 2016 USWMRC, so when this event came into the planning pipeline, they were the first teammates I asked to sail and all 3 were psyched to defend the title. Molly and I are both Yale sailing alumni and got to know each other sailing 470s before the 2008 trials and before my move to San Francisco. She trims the main for me and runs the pit downwind, all the while applying her tactical mind to help us make high percentage moves around the course. Karen trims the jib and spinnaker for us and is the key to our speed. She is super strong and has a positive spirit that keeps us thinking constructively and often smiling. Hannah works the bow. She is methodical and forward thinking, managing all the elements forward of the cockpit that can be problematic but are so essential to success. Together we share a fierce competitive spirit that is grounded by simple love for playing the game. StFSF: This is your third consecutive win – how do you personally stay at the top of your game? NB: I am fortunate to do a lot of sailing. I race J/105s regularly with my husband Bruce, and I usually sail 5 or 6 match racing or team racing regattas throughout the year. Sometimes the schedule and my performance yield additional opportunities to race high level championships. In all of this racing I am surrounded by really good competition in a variety of venues and conditions, and all of that stacks up to experience that keeps me competitive. I like to get a few hours of practice in before big events, too, which recharges the muscle memory and reminds me of the go-fast techniques and settings for sailing a particular type of boat in a particular type of venue or condition. 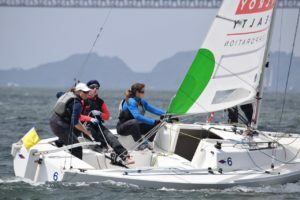 StFSF: Your advice for women wanting to either hone their match racing skills, or take up match racing? NB: In addition to looking for opportunities to sail regattas and clinics (check out Oakcliff Sailing Center, regional US Sailing champs qualifiers, the California Dreamin’ series), put together your own sparring sessions at your own sailing venues. You’ll need a couple of hours (we find weeknights work well), some willing sailors, a minimum of two matched boats, and 3 marks. Set a starting line with two marks (designate one as a leeward mark too), and a windward mark. Sync your count down timers at 5 minutes, enter the start box at 4 and… you’re match racing! Check out https://www.ussailing.org/competition/small-boat-racing/match-racing/ for all kinds of resources: scheduling, rules, tactical do’s and don’ts, video links, etc. 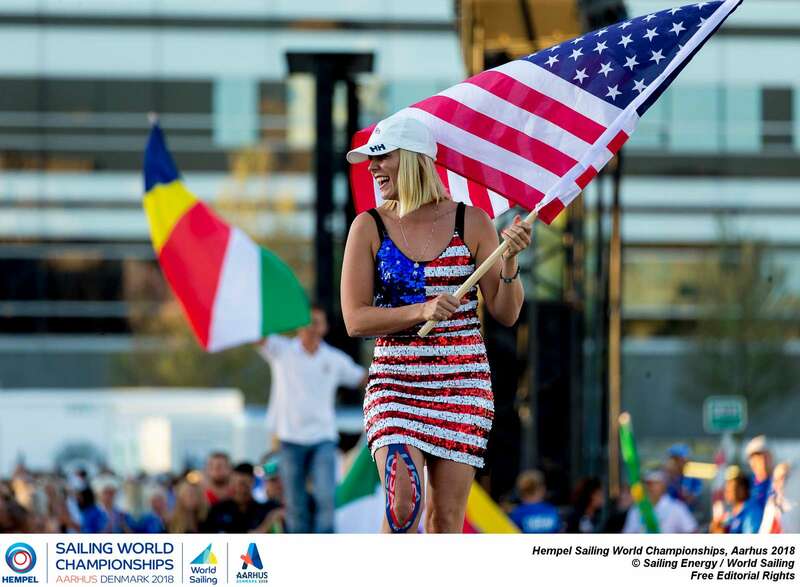 The US Sailing Team has completed racing at the highly anticipated 2018 Hempel Sailing World Championships, which concluded in Denmark’s second largest city on Sunday. The U.S. walked away with three country qualification spots and a much deserved Gold Medal for kiteboarder Daniela Moroz (Lafayette, Calif.) who captured first place honors in the Women’s Formula Kiteboard competition. Moroz had one of her best performances yet even amidst constantly changing weather patterns across the courses. She won 14 out of 16 races this week. This marks the third consecutive World Championship title for Moroz. The talented kiteboarder has won the Hydrofoil Pro Tour in 2016 and 2017, the Women’s Formula Kite World Championships in 2016 and 2017, and recently the 2018 Formula Kite Europeans in Warnemuender, Germany. Moroz attributes her success to her extensive support system as well as her “do what you know how to do” mindset. Her coach this week in Denmark, Robbie Dean (Sausalito, Calif.), is a leader in the kiting world, having started the Hydrofoil Pro Tour in 2015. The inclusion of kiteboarding into World Sailing’s Olympic Class events started at the 2014 World Cup Abu Dhabi, UAE, while Aarhus 2018 will be the first Combined World Championships to include hydrofoil kiteboarding. 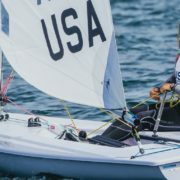 After six races, Paige Railey, Team USA’s top contender in the Laser Radial, sits third overall in the 119-strong fleet at the Sailing World Championships underway in Aarhus, Denmark, after taking a second and a first place respectively on race day 1 of this all-important Olympic qualifying event. On a personal level, it’s fair to say it’s also an all-important event for Railey who is on her 4th Olympic campaign and still striving for a podium finish although she does have five career World Championship medals, the most of any athlete in the history of the Laser Radial class. St Francis Sailing Foundation caught up with Railey, a Foundation grantee, just prior to Aarhus. 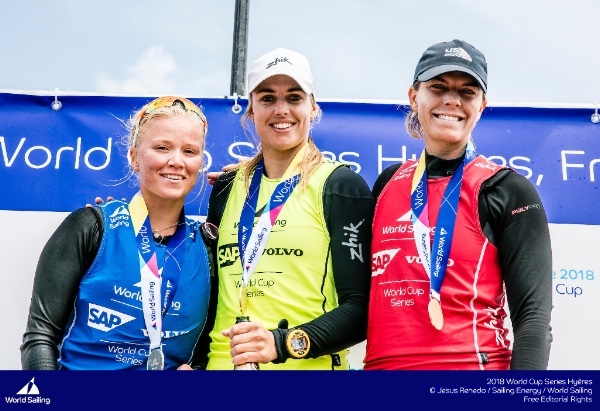 The 31-year old Floridian has had a whirlwind six months leading up to Aarhus, a venue she has not previously sailed, with racing and training events where she worked on specific skills looking out to both Kiel Week and the Sailing World Championships. Going into Aarhus, she felt like she had done the work she needed, and right now it appears that the hard toil is paying off. “I got myself to a point where I felt I could be competitive and ready to race,” Railey enthused. Placing 7th at Kiel Week was not a happy result for Railey; she had hoped for top 3 but was nursing an injury which stalled her performance. Her confidence was much higher going into the Olympic qualifier. “It’s going to be great and I think we have an extremely high possibility of qualifying in class for the Olympics,” she said. This week she’s closely watching her usual competition, namely the Danish, Dutch, British, Hungarian and Finn Radial sailors. “There’s a really large range of experience in the fleet – some of these women are new to this in the past five years and some I’ve been competing against for 10+ years,” Railey noted. Railey has been at this for a long time and yet she always manages a smile and seemingly endless patience. How does she do it? Rolling into her fourth Olympic campaign, she noted that things are now somewhat different than during her first campaign – Beijing 2008. Exciting times ahead for next generation of elite sailors & Olympic hopefuls! Did you know that US youth sailors scored five medals in total from 9 events at the recent Youth World Championships, winning the 2018 Nations Cup? Wow! To say we are thrilled is certainly an understatement and we are proud to share this news with friends of the Foundation and its supporters. 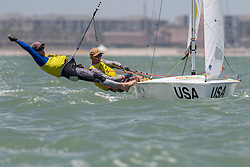 The US team scored a total of 28 points over 5 days, miles ahead of the Kiwi team who took second with 59 points, and the Italians who took third with 62 points. Held in Corpus Christi, Texas July 14-21, the competition medal haul by the US team was an incredible achievement and testament to the smart and hard work our athletes, coaches and staff are making in the quest to develop the best sailors anywhere. The Foundation congratulates all athletes including US gold medal winners Joseph Hermus and Walter Henry in the 420 Men’s Class, with 15 pts – a whopping 14 pts ahead of silver medalists. Carmen Cowles and Emma Cowles took gold in the 420 Women’s Class with 11 pts – 13 pts ahead of silver medalists. Charlotte Rose in the Women’s Laser Radial took gold with 10 pts, ahead of silver medalist by 10 pts, while in the 29er Women’s, Berta Puig & Isabella Casaretta took with 55 pts, 10 pts ahead of bronze medalists. The timing of these great results couldn’t be better with the recent launch in San Francisco of FAST USA – the Facility for Advanced Sailing and Technology. Our elite youth sailors will be able to enjoy the support of this flagship training base to further improve their game on all levels as they look to future podium finishes. 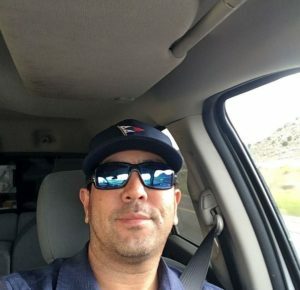 Adam Corpuz-Lahne, StFYC head sailing coach, was halfway through Nebraska and just finishing up an Italian sub from the refrigerator section of a gas station when we caught up with him to have a chat about the upcoming east coast C420 tour he is leading with a group of sailors ages 16-18 from the StFYC (a grantee of the St Francis Sailing Foundation). First stop is the C420 National Championship at the Brant Beach Yacht Club, New Jersey, July 17-19. Chloe Holder/Kristen Zarembinski and Sarah Cuyler/Keliah Stypulkoski will be sailing the event. The two teams then head to the US Sailing Youth Women’s Double Handed Championship in Mentor, Ohio, July 24-29, to compete for the Ida Lewis Trophy in C420s. While the all-female teams are competing for the Ida Lewis Trophy, three C420 co-ed teams will compete at the Hyannis Regatta, at the Hyannis Yacht Club, July 27-29. Mats Keldsen/Reid Wishner, Buster Baylis/Evelyn Plam, and Nicholas Dorn/Daria Terebilo will use this regatta to tune up and work on their big fleet sailing before heading to Buzzards Bay for the C420 North American Championship, August 2-5, off Fort Tabor, in Buzzards Bay, MA. Zarmebinski will team up with Sean Englebrechten from Sausalito YC for the North Americans. This is just the second year that the St FYC has participated in an east coast tour as the club works to diversify its junior program to offer more of a balance between club sailing and scholastic (high school) sailing. And a production it is. For Corpuz-Lahne, the effort started about six months ago when he started putting feelers out for who was able to attend, which events the kids wanted to do, and how many boats would be needed. The biggest part of the preparation, he says, is getting everything laid out and making sure every boat has every piece of equipment it needs. Corpuz-Lahne reports that the kids are very excited to be touring. His favorite snack along the way? Beef jerky. “I eat it like it’s going out of style!” Corpuz-Lahne joked. 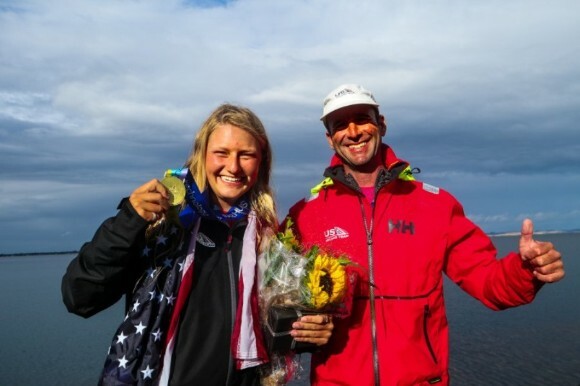 St Francis Foundation grantee and US Sailing Team member Paige Railey is enjoying time on the podium at recent events. After taking bronze at the World Cup in Hyeres, France, Railey followed up with Silver at the 2018 Laser Senior European championships / Radial Women, held at La Rochelle, France from May 5-12. 11 races were completed (with two throw-outs) in ideal conditions over six days of racing in medium to strong winds, sun and warm weather with the exception of rain on the last day of racing. It’s been a tough start to the year for Nacra 17 Olympic hopefuls Helena Scutt and Bora Gulari. The pair recently competed at the Sailing World Cup in Hyeres, France (April 24-28) where they finished 22 out of 30 – not the result they had hoped for but not surprising after Scutt broke the middle metacarpal in her right hand during a January training session in Buenos Aires which required surgery for the insertion of a permanent titanium plate. 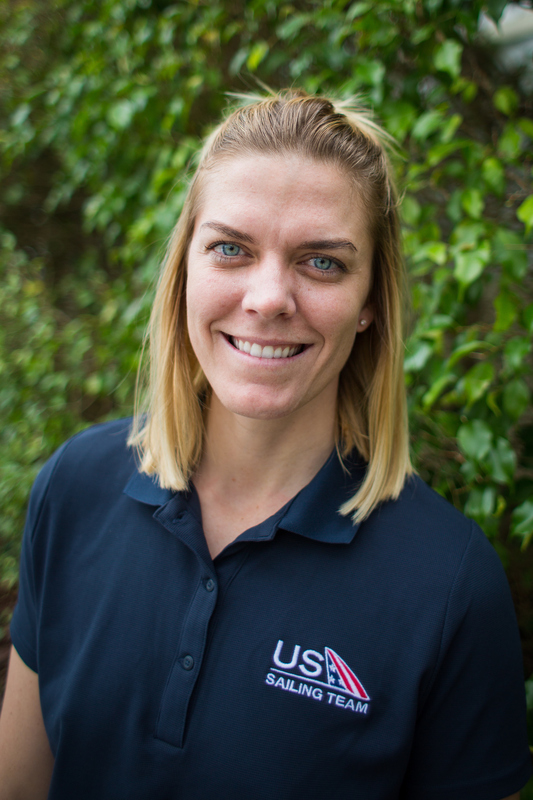 The USOC, the Elite Athlete Health Insurance, and their National Medical Network provided Scutt with great care which included a week at the Olympic Training Center in Colorado Springs after surgery where technology was used to bring the swelling down as fast as possible. Scutt was able to start physical therapy and enjoy their (incredible) gym. Scutt attended the Foundation’s annual auction in late March where she delivered a moving speech (there was barely a dry eye in the room) and following that she took on three days volunteer coaching at a Nacra 15 clinic in Long Beach, Calif., a win-win for Scutt and attendees alike. “The kids’ energy and excitement were contagious,” Scutt reported. Less than 7 weeks after Scutt’s surgery, she and Gulari we were able to get back on the water, this time in Barcelona. Scutt, sporting a custom hand brace, had to make some compensations for the lack of grip strength in that hand but nonetheless it was a huge relief – they were able to train. 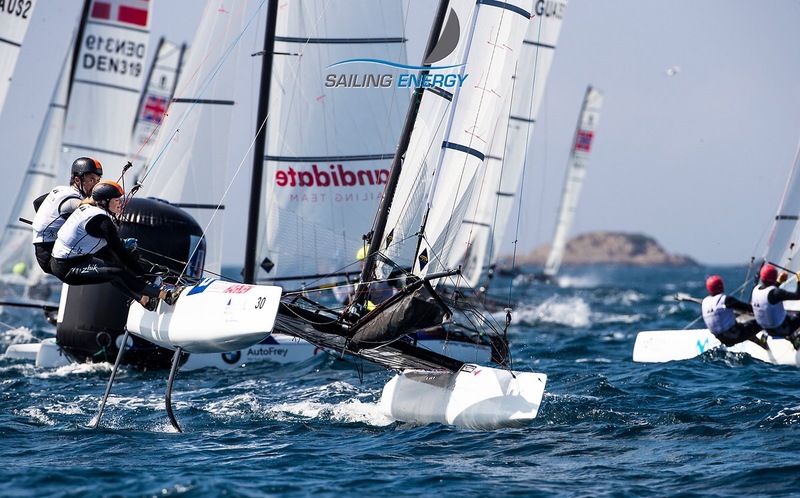 Next up was Hyeres for three days of training before the World Cup Series. The first day of racing was very light and after a bad start, at the top mark, the pair just missed the last puff strong enough for foiling downwind and did not make the finish time window for the only race that day. The second day of racing started with a black flag for disqualification for Gulari/Scutt. In the next two races they took 23 and 11, after two good starts but in a tricky breeze. The third day of racing was light breeze again and the pair scored 23, 17, 12. In just their second regatta as a team, Scutt said she and Gulari are learning a lot about communicating with each other. It was also their first regatta working with coach Mike Ingham, the Nacra 17 squad coach for the US Sailing Team. “We’re excited about his perceptiveness, knowledge and dedication,” Scutt commented. 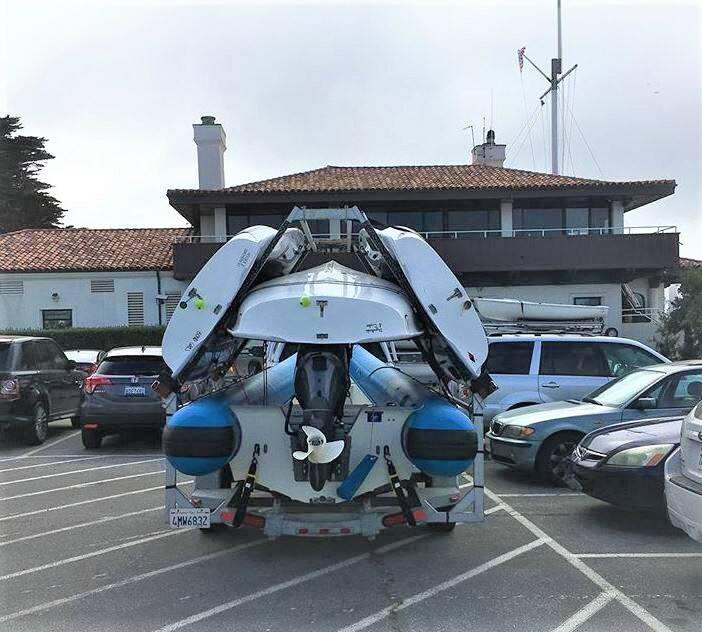 In mid-May, the Gulari/Scutt team trained for two weeks in Long Beach during which time they also joined the US Sailing Team Camp in San Francisco. They’re looking forward to getting back to work and logging hours on the water, with a view to their next regatta, the World Cup Final on June 3-10 in Marseille, France. Pictured: Laser Radial Medalists, World Cup Series Hyères 2018. From left: Monika Mikkola (FIN), Marit Bouwmeester (NED), Paige Railey (USA). Photo: World Sailing. 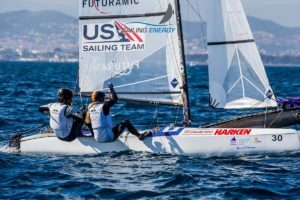 US Sailing Team athlete and two-time Olympian Paige Railey (Clearwater, Fla.) last weekend took home the bronze medal in the Laser Radial at World Cup Series Hyères 2018. Railey recently committed to campaigning for Tokyo 2020 in the women’s one-person dinghy, in which she has enjoyed a long and successful career at the international level. The Floridian sailor was near the top of the elite 64-boat fleet all week in France, winning three races in the 10-race qualifying round before finishing 8th in Sunday’s medal race. 2017 US Sailing Rolex Yachtswoman of the Year Erika Reineke (Ft. Lauderdale, Fla.) also made the medal race in the Radial, and finished 6th overall. Railey has only been active in Olympic class sailing for about six weeks in last 20 months since the Rio 2016 Olympics concluded, and said that her results in Hyères were personally encouraging. “I decided to campaign for Tokyo  because I’ve achieved almost everything you can achieve in the Radial. The last missing piece is an Olympic gold medal. If I can secure that, I think I can walk away saying I’ve done everything you can do in this boat,” said Railey, a record five-time Laser Radial World Championship medalist. 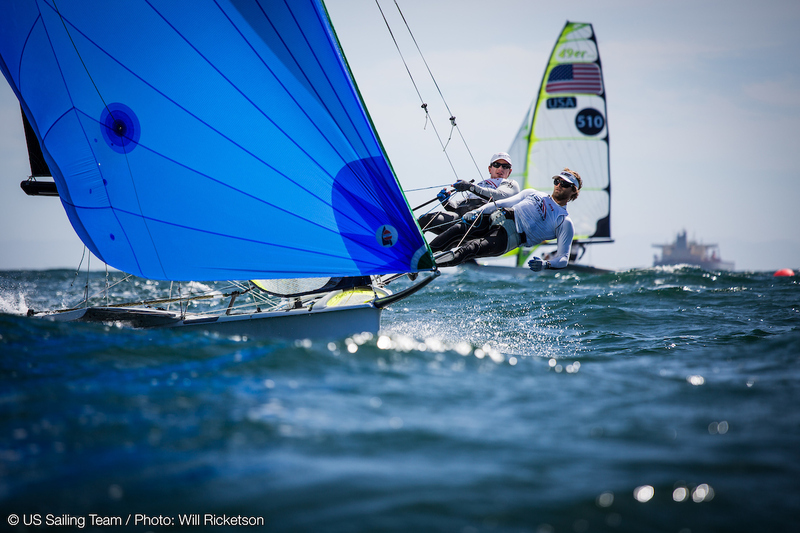 The US Sailing Team will be training in the San Francisco Bay Area this spring. In the near-term, accommodation is being sought for an off-water seminar being held at the St Francis Yacht Club May 13-15. Housing is needed for 20 athletes and 10 coaches. No cost housing will be helpful for those athletes on a tight budget. This is an opportunity to get to know the country’s most talented young sailors while at the same time helping in a big way!